Wigan and Leigh Young Carers are at the Wigan Rotary Community day. From all involved in the charity I would like to express our heartfelt thanks to the Leigh Inner Wheel for their donation of £500. 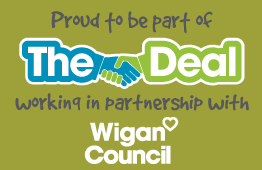 @WiganandLeighYC We're very active on Twitter these days and have lots of followers, but always welcome more! Congratulations! Nationwide customers have nominated Wigan and Leigh Young Carers to feature in our Community Match scheme.